If there’s any story that is truly classic English children’s literature, it is Lewis Carroll’s Alice’s Adventures in Wonderland. That beguiling, mad, strange story of a girl who inadvertently visits another world has been retold in film and book form over and over again. And it is very evident, if one looks at my reading history, that I am fond of adaptations and retellings. For heaven’s sake, fairy tales are very nearly my favorite fantasy subgenre! Oh, and I like zombies. Enough so that I have friends who draw me original zombie artwork for my birthday and send me zombie bonbons on Valentine’s Day. Ahem. So it would seem that a new young adult novel meshing Alice in Wonderland with zombies would… appeal. AND BOY DOES IT EVER. Pardon the volume. I’m just so excited (really!). I mean, tell me YOU can resist a book with the tag line 'Off with their heads.' I can't. 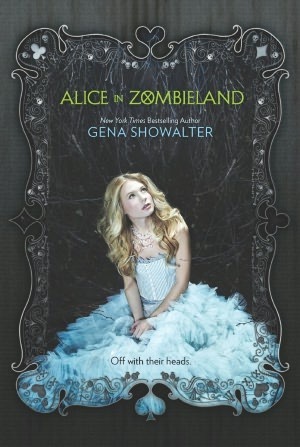 Alice in Zombieland by Gena Showalter will be published by Harlequin Teen, and releases on September 25th, 2012. I want to read this one too - Showalter is usually very fun. I love zombie stories! I've just added this book to my TBR list!! I'm torn between this because I hate zombies but I love ALICE IN WONDERLAND. I've been hearing a lot about this one, and I'm eager to read it as well! Thanks for stopping by my blog as well. i haven't heard of this one but i like the sound of it. and it's by gena showalter so it should be good! great pick! I'm waiting for this one, too! Alice + zombies? Two crazy things in one story, and it sounds awesome. Love Alice in Wonderland and Zombies, so those two things in a book should be amazing. I really can't wait to get my hands on this book. I'm extremely excited about this one!! I love all things Alice! I hate zombies but I'm intrigued by this book. Great pick!